A few nights ago as I watched the PBS News Hour, I was pleasantly surprised to see a female poet appear in the last segment of the news. Ada Limon spoke passionately about the radical hope of poetry as an effective way of communicating and touted that people today are reading more and more poetry, exploring the nuance and mystery of it, as well as using it as a way to express rage. Limon also pointed out that poetry was a place where we admit to the unknown and sometimes practice beauty, make music from specificity and empathy. I was inwardly applauding her comments during the entire segment. Although the work of other poets: Stuart Friebert, Neil Harrison, Gary Entsminger, Scott Davidson, to name a few, contributed highly notable work, I chose to showcase the Oriental poets who take readers farther afield to explore the “nuance and mystery” of Chinese poets the Muse inspires. Also impressive: “To A Tree,” a poem by the deceased Dutch poet, M. Vasalis, translated by Fred Lessing and David Young, which quickly sets the tone of international sharing on the opening pages of this issue of Pinyon Review. As I’m a tree hugger, I appreciated the poet’s plea for trees not to move, “… for who could bear it if a tree pulled up its roots/and danced away?…” Vasalis muses on the eternal qualities of trees that [are not] “made to move,/in lengthy lines, like steady music, simple,/and then again stand still, a slender temple…I stood there in the wet and heavy grass/and felt that I had drifted into paradise…” Gary and Susan plan to publish a career-spanning selection of Vasalis’s poems in 2019. Interestingly, she was a Dutch psychiatrist who specialized in the treatment of children and was recognized as the most widely read and admired poet of her country. In this 14th edition, an intriguing article, “The Studio of The Three Arrows,” by Robert Elliott and Susan Entsminger features photography by 20th century photographer Harold A. Taylor who in his early 20’s hiked through Yosemite National Park to photograph its valley — “massive rocks, waterfalls, sequoias…” partnering with Eugene Hallett to open the Studio of the Three Arrows, so named for the Yosemite Miwok Indians and the English-born Taylor’s family crest. The photographs, as explained by Susan Entsminger and Robert Elliott, were created by using dry glass plates that produced sharp images and beautiful contrast. Susan’s grandfather, William T. Elliott, acquired the glass plate negatives when Taylor retired as he and Taylor had been in a photography business together. Elliott gave his son, R. Elliott, the Yosemite and California Missions Collection, which he is digitizing and archiving. The arresting photograph of “Wawona With Coach,” is a digital scan of one of Taylor’s beautiful glass plates. Photographs in this article provided by father and daughter make this 14th edition a real collector’s piece. Along with the Oriental poems, I couldn’t resist including the haiku of award-winning Gary Hotham who lives in Maryland; e.g., “outside the lines/our grandson includes more/with one crayon”… and “mixing with the afternoon sky/a lifetime of clouds/disappear.” Hotham has won first place in the Harold G. Henderson Memorial Haiku Awards and second place in the San Francisco International Haiku Competition. Pinyon published his Stone’s Throw, described as a book echoing the Japanese masters. Pinyon Publishing just celebrated its tenth year as a publisher of quality literature and art in book form. 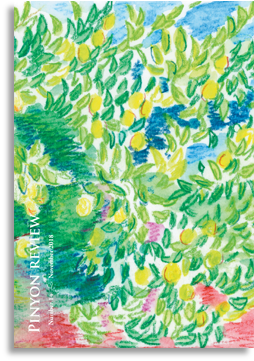 Pinyon Review, a journal of the arts and sciences, is one of the few journals that has kept its mission of featuring emerging and well-known poets, fiction writers, translators, artists, and photographers. The magazine is produced in a log cabin on a plateau in southern Colorado where Gary and Susan share a life devoted to the cause of sustainability and quality publishing. On a personal note, they have consistently featured and supported my writing and reviewing of other writers’ work. Thank you, Pinyon, from all of your writers, photographers, and artists. 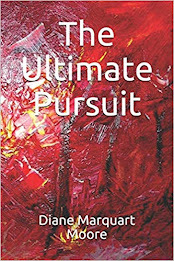 Available from Pinyon Publishing, 23847 V66 Trail, Montrose, CO 81403.